Today I put that to the test. 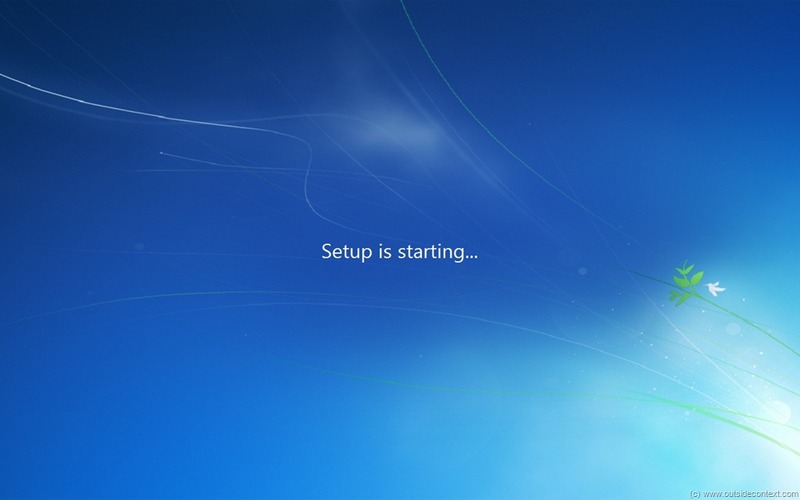 I have been Installing and configuring Windows since the days of 3.1. My first exposure to the product range was Windows 2, which my father had on his PC. My first professional exposure was the task of migrating 3.1 to Windows 95 at Spandex Plc in Bristol, way back when I was only a 14 year old IT intern. Since then I have developed a career in IT and now, at 32, have a Chartered IT Professional award from the British Computer Society. I say this, because it is important that my background and knowledge level is clear. 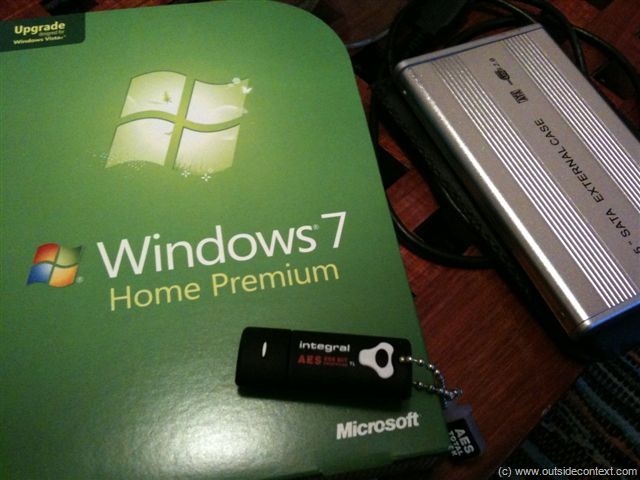 This is as much a guide as anything else, so in that spirit here is what you need to do to upgrade from Windows Vista Home Premium to Windows 7 Home Premium. 1. If your original computer came with Vista. That is, it either had it installed when you bought it, or has a “Ready for Vista” sticker on it. 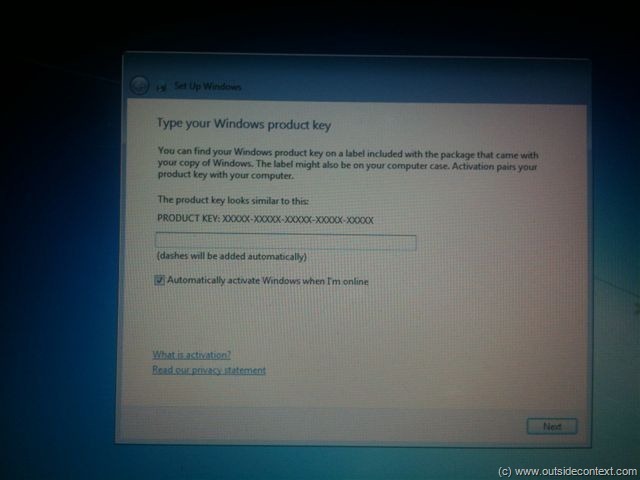 This means that Microsoft knows about your machine and it reaches the standards they set for their software. Half the battle here, and half the errors in previous upgrades, would have been due to non standard equipment that confuses the upgrade. 2. 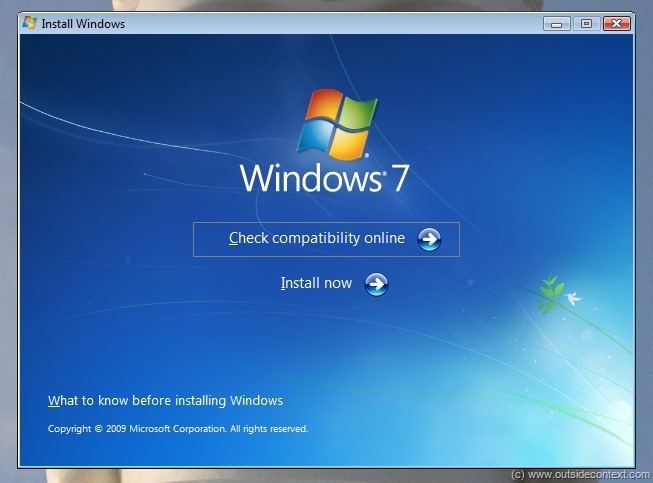 Which version of Windows 7 you want to go to. There are numerous charts on the Net about this, but essentially I am keeping this easy and going from Premium to Premium. I am doing this because Professional is over twice the price, and I am going to try and see if I need it before I go for it. 3. The price of the software. As usual, and much lampooned, Microsoft have produced something like twenty versions of this product. I have gone for the Premium Upgrade package, which i bought, in all places, at Tesco’s supermarket. 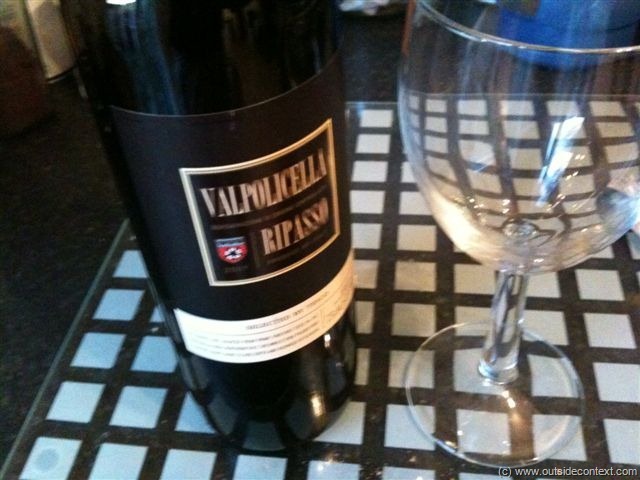 This was £56 and a quick price check via the red eye app on my iPhone told me that this was a good price. 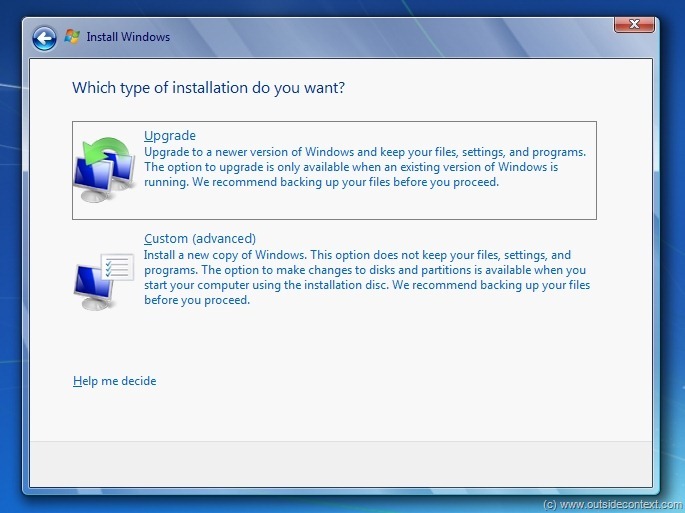 Now, one of those, you may think, is not an actual requirement to upgrade Vista to Windows 7. All I can say is, “You obviously haven’t done this before”. 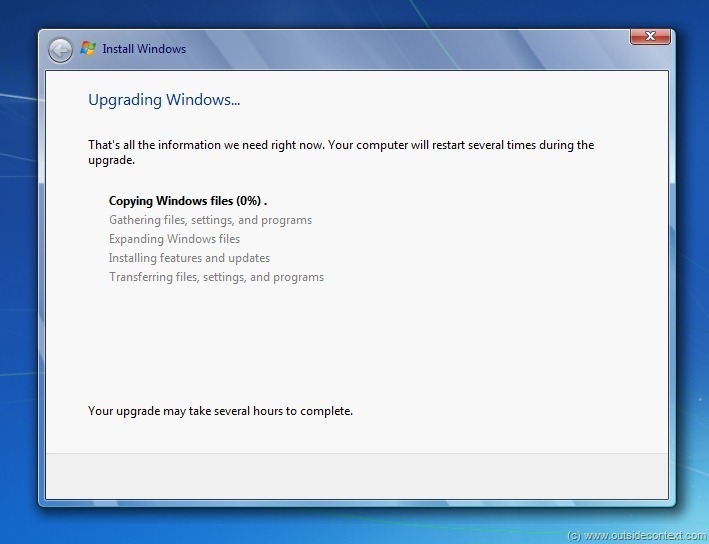 Upgrading is going to take ages. Ages. There will be moments in the upgrade when you wonder if it has crashed, if it ever going to finish. It will probably look stuck on something at least once; endlessly ruminating at a low percentage. This is all normal. If you do the upgrade while stressed, high on coffee, arguing with your wife or in a hurry: then you will fail. For me, a nice glass of wine, supper on the way and a long Sunday afternoon; that long dark teatime of the soul, is completely relaxing and the upgrade will not and cannot stress me out. Even an professional IT person is prey for his emotions. I once saw a guy kick a £250,000 server because it failed a backup. Failed a backup. As in, it was not backed up and he was kicking it! Seriously, pray heed my advice and whatever your poison is; take a wee drop to relax. Frankly, if my PC were waterproof, I would do these things in a warm bath with Cesca massaging my back! 1. Scan your computer with your anti virus. Do this overnight the day before as this takes ages. These two steps are vital. a fragmented computer will possibly triple the upgrade time. 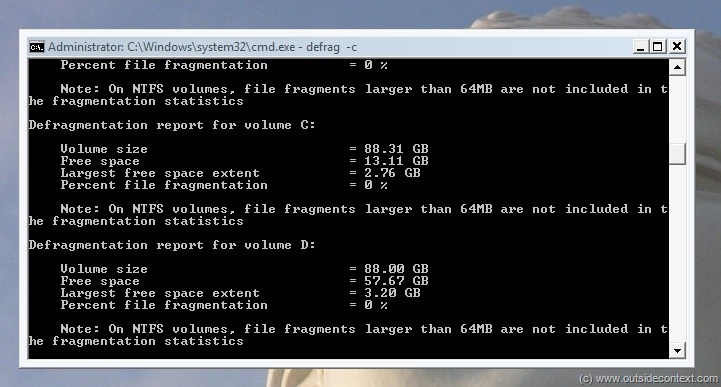 Mine is not usually fragmented, but this could take a while itself. 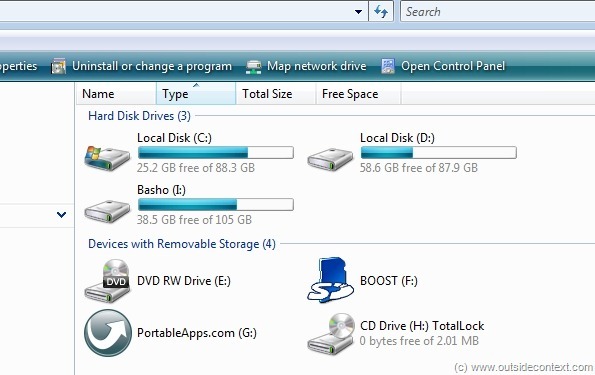 It is vital that you go through your computer and remove all the junk you have installed over the months you have been stuck with Vista. It is especially important to remove anything that interacts with the desktop. So Rocket Dock, Google Chat, etc. 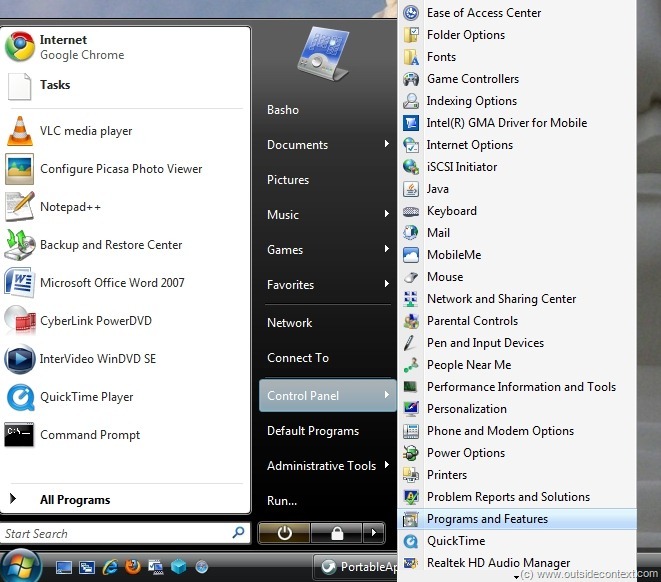 Plus all the little applications that sit in the bottom right (by the clock), anything that isn’t made by Microsoft, came with a major product or came with the machine should be removed. I also uninstalled my firewall as I am sure that it is not going to be compatible. 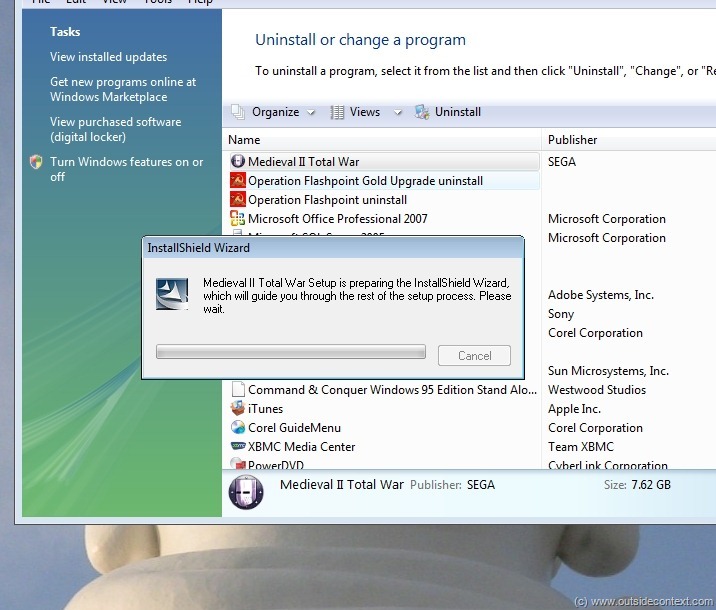 Since my Anti Virus is a free one, I uninstalled that too. 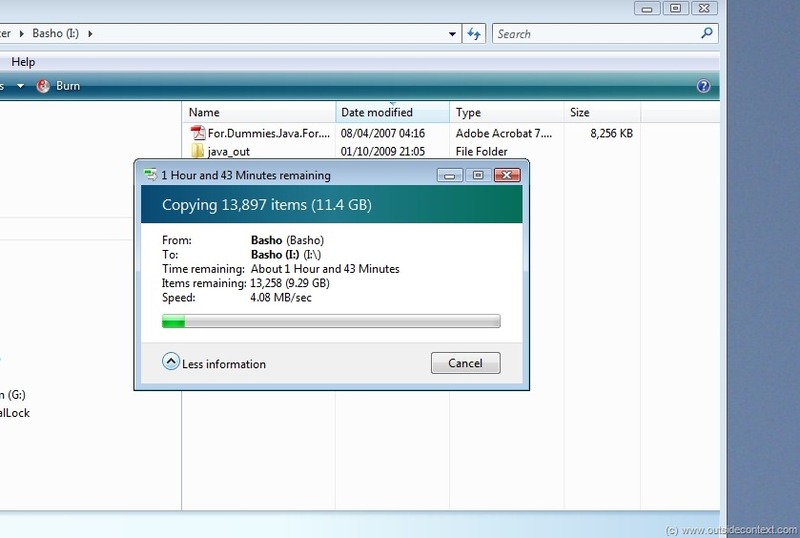 Backing up is something we all should do more of. Now is the time to copy off your important documents, photos and pictures. 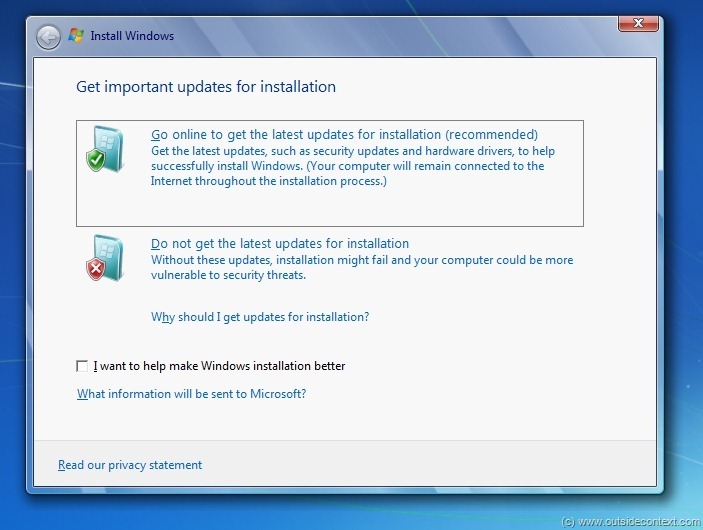 If the install fails, you probably wont lose them, but just in case and you should be doing it anyway. 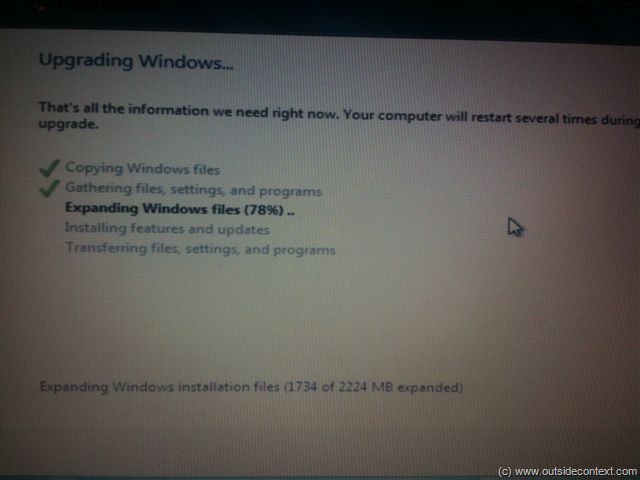 You need lots of free space to install Windows 7. There is an official number, but on a laptop; the more the better. This is due to the RAM disk the upgrade will (probably) create, the more space that there is for this, the less likely your are to have problems. Half way through the options I got this screen. 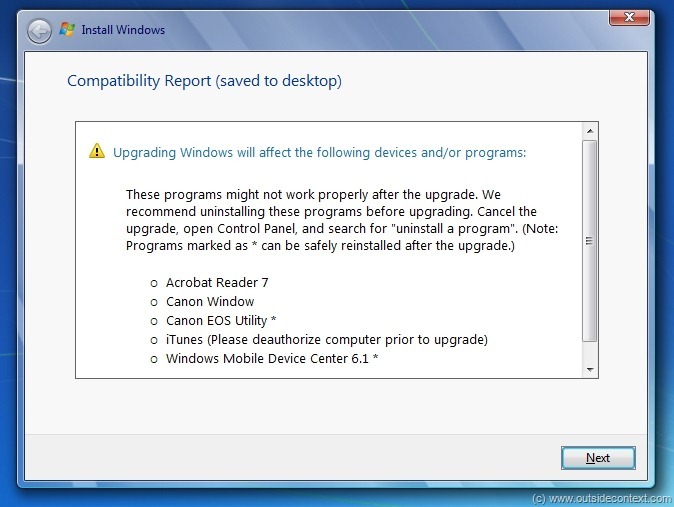 These are applications not compatible with Windows 7, or may screw the upgrade. Notice that iTunes is here. I quit the upgrade and removed all of these apps. I can always put them back when I finish. As predicted, I did have a screen where the system sat on 38% for an hour and then jumped to 80%. This is classic Microsoft and nothing to worry about. The system also restarted about 3 times. When this happens do not touch anything. Dont press anything, don’t answer any message that pops up suggesting “press button to boot from CD” or “Chose operating system to load”. The upgrade will make all the choices; let it. 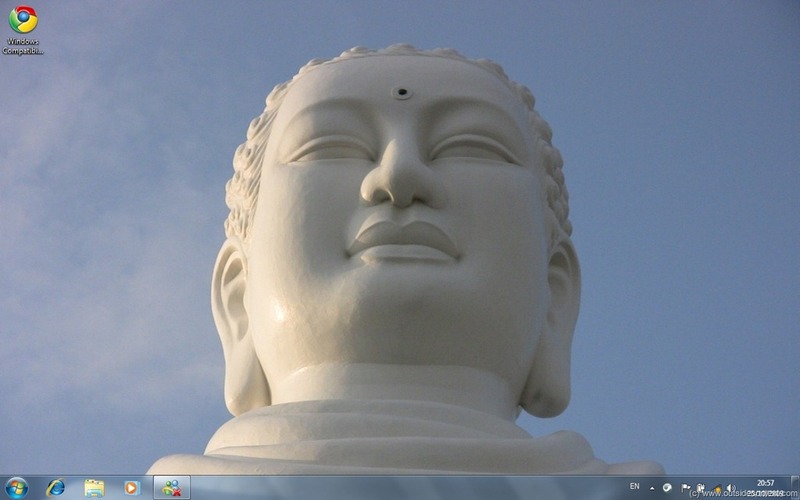 So, I am now on Windows 7! Great, and it only took 5 hours. You notice that I did all this without Internet access (I have none at home), and when I get to a cafe later, I will do the online registration and patching. Have I had any problems since upgrading? Only one. When my machine starts I get some sort of Intel error pop up. This is probably going to be sorted later today when I update via the internet. Overall, the upgrade was the most painless I have ever encountered. I would go so far as to say that it was easy. At one point I was showing my wife the install going and accidentally ejected the DVD! Upon putting it back in, the system carried on flawlessly. Phew. Does this mean that Microsoft have changed? Only time will tell. 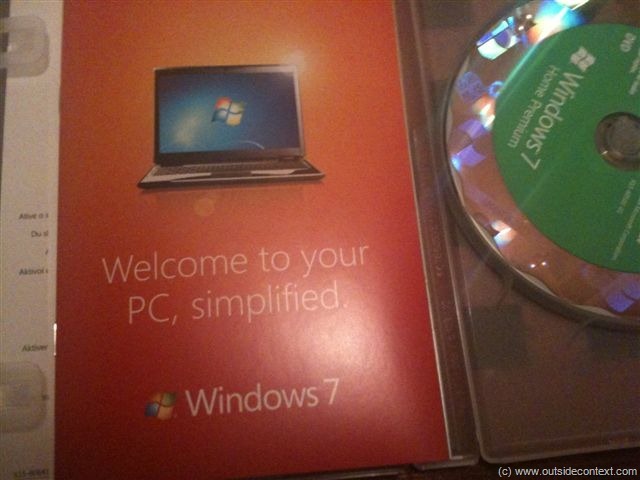 But, as a new Windows 7 user, I can say that I am very happy!